Everyone will love these adorable wild animals with fun personalities! Decorate rooms indoors or lawn/garden, patio or entryway areas outdoors. Hard to believe they all start from a low cost patio paver stone! 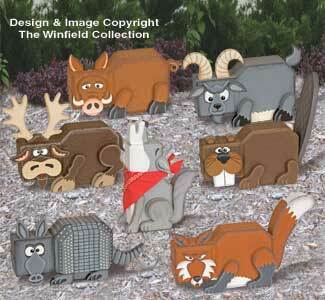 You get full-size patterns plus instructions and color paint sheet to make 12 Wild Animal Paver Pals (all 7 pictured plus raccoon, chipmunk, grizzly bear, skunk and deer).